Published: Sunday, April 21, 2013 at 8:25 p.m.
After two failed tries, a Wilmington charter school set to open in August will likely set up shop in the Peabody Center on N. 6th Street. Douglass Academy, a charter school geared toward students living in Wilmington low-income and public housing units such as Jervay, Hillcrest, Houston Moore and Greenfield Village, will likely pay nonprofit Friends of New Hanover County Community Action $1 a year for 15 years to lease the building, said Baker Mitchell, president of The Roger Bacon Academy, the charter school management company that will run Douglass Academy. That will likely be formally approved by the charter school’s board on April 25, Mitchell said. 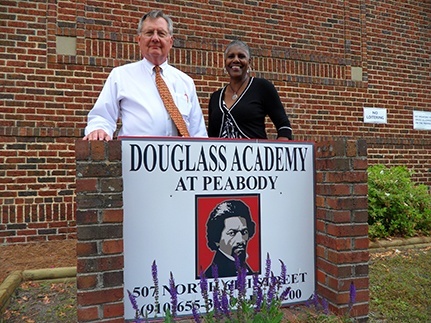 The Peabody Center marks the third housing change for Douglass Academy since it received preliminary approval to open as a charter school from the state Board of Education in late 2012. The school originally wanted to build a new structure at South 13th and South 14th streets along Greenfield Street and had gotten that site approved by the city. But the city’s approval included zoning requirements that changed the structure of the building and upped the cost. Other regulations limited the amount of playground space students could use. So Douglass Academy moved to Plan B: using the old Lakeside High School building, less than half a mile from the original space and currently not in use. The Roger Bacon Academy filed a lease to rent the building for $1 a year for 30 years and offered to pay for renovations like asbestos removal and a leaky roof. The school board rejected that, submitting instead a lease for $72,000 a year for 15 years. “Our interpretation is if it’s an unused facility, then we’re entitled to use it as long as we pay for upkeep and maintenance and all that,” Mitchell said. At that point, the school board decided to reduce the rent further to try to accommodate Mitchell, said school board attorney Wayne Bullard. The board unanimously approved a new lease at its April 16 work session that would set the rent at $54,000 a year for 15 years. Bullard said the board wanted to charge rent as a way to recoup what they’d lose while Douglass Academy was using it. But Mitchell viewed rent above $1 a year as a way for the school district to make money. Douglass Acadmey will open in August for kindergarten through second grades, expanding through fifth grade by 2017. Students can submit applications for enrollment through May 17.